English (Traducir este texto en Español): "Vapper" is the giant wreck of an Estonian trawler combined with a build-in fish factory. She is approximately 102 meters long and 15 meters wide and stands upright on the bottom on 25-26 meters depth. Where she meets the bottom small mounds of clay has been extruded from the bottom silt because of the pressure when "landing". Sea water in this locality is almost brackish - this has a considerable effect on marine life on the wreck - you will find no salt craving organisms here. The wreck is covered with blue mussels and seaweeds - common shore crabs crawling along with fish like bullheads and rock gunnels. Around and inside the wreck cod is quite common. The bow of "Vapper" is majestic featuring a number of thick trusses hanging to the bottom. Swimming along bottom to the aft two large ducted propellers and rudders are found - here also the deepest bottom at +27 meters. At the aft a wide ramp is leading up to the aft deck at around 16 meters depth - this is covered by wooden planks and contains various machinery, winches and cranes. On either side two large smokestacks are found. The middle deck leading to the bridge structure is at 10-12 meters depth containing various kinds of access to the innards of the ship. The bridge is fully accessible through the open front windows and now almost devoid of any equipment - except a multitude of cables. The top of the structure is at 7 meters depth - a perfect place to hover and make your 3 minute stop on the way back. English (Traducir este texto en Español): &quot;Vapper&quot; is the giant wreck of an Estonian trawler combined with a build-in fish factory. She is approximately 102 meters long and 15 meters wide and stands upright on the bottom on 25-26 meters depth. Where she meets the bottom small mounds of clay has been extruded from the bottom silt because of the pressure when &quot;landing&quot;. Sea water in this locality is almost brackish - this has a considerable effect on marine life on the wreck - you will find no salt craving organisms here. The wreck is covered with blue mussels and seaweeds - common shore crabs crawling along with fish like bullheads and rock gunnels. 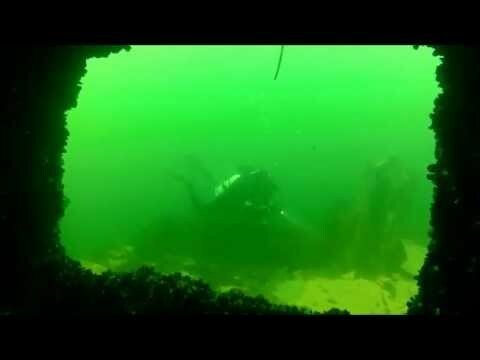 Around and inside the wreck cod is quite common. The bow of &quot;Vapper&quot; is majestic featuring a number of thick trusses hanging to the bottom. Swimming along bottom to the aft two large ducted propellers and rudders are found - here also the deepest bottom at +27 meters. At the aft a wide ramp is leading up to the aft deck at around 16 meters depth - this is covered by wooden planks and contains various machinery, winches and cranes. On either side two large smokestacks are found. The middle deck leading to the bridge structure is at 10-12 meters depth containing various kinds of access to the innards of the ship. The bridge is fully accessible through the open front windows and now almost devoid of any equipment - except a multitude of cables. The top of the structure is at 7 meters depth - a perfect place to hover and make your 3 minute stop on the way back. &quot;Vapper&quot; is the giant wreck of an Estonian trawler combined with a build-in fish factory. She is approximately 102 meters long and 15 meters wide and stands upright on the bottom on 25-26 meters depth. Where she meets the bottom small mounds of clay has been extruded from the bottom silt because of the pressure when &quot;landing&quot;. Sea water in this locality is almost brackish - this has a considerable effect on marine life on the wreck - you will find no salt craving organisms here. The wreck is covered with blue mussels and seaweeds - common shore crabs crawling along with fish like bullheads and rock gunnels. Around and inside the wreck cod is quite common. English (Traducir este texto en Español): &amp;quot;Vapper&amp;quot; is the giant wreck of an Estonian trawler combined with a build-in fish factory. She is approximately 102 meters long and 15 meters wide and stands upright on the bottom on 25-26 meters depth. Where she meets the bottom small mounds of clay has been extruded from the bottom silt because of the pressure when &amp;quot;landing&amp;quot;. Sea water in this locality is almost brackish - this has a considerable effect on marine life on the wreck - you will find no salt craving organisms here. The wreck is covered with blue mussels and seaweeds - common shore crabs crawling along with fish like bullheads and rock gunnels. Around and inside the wreck cod is quite common. The bow of &amp;quot;Vapper&amp;quot; is majestic featuring a number of thick trusses hanging to the bottom. Swimming along bottom to the aft two large ducted propellers and rudders are found - here also the deepest bottom at +27 meters. At the aft a wide ramp is leading up to the aft deck at around 16 meters depth - this is covered by wooden planks and contains various machinery, winches and cranes. On either side two large smokestacks are found. The middle deck leading to the bridge structure is at 10-12 meters depth containing various kinds of access to the innards of the ship. The bridge is fully accessible through the open front windows and now almost devoid of any equipment - except a multitude of cables. The top of the structure is at 7 meters depth - a perfect place to hover and make your 3 minute stop on the way back. English (Traducir este texto en Español): &amp;amp;quot;Vapper&amp;amp;quot; is the giant wreck of an Estonian trawler combined with a build-in fish factory. She is approximately 102 meters long and 15 meters wide and stands upright on the bottom on 25-26 meters depth. Where she meets the bottom small mounds of clay has been extruded from the bottom silt because of the pressure when &amp;amp;quot;landing&amp;amp;quot;. Sea water in this locality is almost brackish - this has a considerable effect on marine life on the wreck - you will find no salt craving organisms here. The wreck is covered with blue mussels and seaweeds - common shore crabs crawling along with fish like bullheads and rock gunnels. Around and inside the wreck cod is quite common. The bow of &amp;amp;quot;Vapper&amp;amp;quot; is majestic featuring a number of thick trusses hanging to the bottom. Swimming along bottom to the aft two large ducted propellers and rudders are found - here also the deepest bottom at +27 meters. At the aft a wide ramp is leading up to the aft deck at around 16 meters depth - this is covered by wooden planks and contains various machinery, winches and cranes. On either side two large smokestacks are found. The middle deck leading to the bridge structure is at 10-12 meters depth containing various kinds of access to the innards of the ship. The bridge is fully accessible through the open front windows and now almost devoid of any equipment - except a multitude of cables. The top of the structure is at 7 meters depth - a perfect place to hover and make your 3 minute stop on the way back. English (Traducir este texto en Español): &amp;amp;amp;quot;Vapper&amp;amp;amp;quot; is the giant wreck of an Estonian trawler combined with a build-in fish factory. She is approximately 102 meters long and 15 meters wide and stands upright on the bottom on 25-26 meters depth. Where she meets the bottom small mounds of clay has been extruded from the bottom silt because of the pressure when &amp;amp;amp;quot;landing&amp;amp;amp;quot;. Sea water in this locality is almost brackish - this has a considerable effect on marine life on the wreck - you will find no salt craving organisms here. The wreck is covered with blue mussels and seaweeds - common shore crabs crawling along with fish like bullheads and rock gunnels. Around and inside the wreck cod is quite common. The bow of &amp;amp;amp;quot;Vapper&amp;amp;amp;quot; is majestic featuring a number of thick trusses hanging to the bottom. Swimming along bottom to the aft two large ducted propellers and rudders are found - here also the deepest bottom at +27 meters. At the aft a wide ramp is leading up to the aft deck at around 16 meters depth - this is covered by wooden planks and contains various machinery, winches and cranes. On either side two large smokestacks are found. The middle deck leading to the bridge structure is at 10-12 meters depth containing various kinds of access to the innards of the ship. The bridge is fully accessible through the open front windows and now almost devoid of any equipment - except a multitude of cables. The top of the structure is at 7 meters depth - a perfect place to hover and make your 3 minute stop on the way back. English (Traducir este texto en Español): &amp;amp;amp;amp;quot;Vapper&amp;amp;amp;amp;quot; is the giant wreck of an Estonian trawler combined with a build-in fish factory. She is approximately 102 meters long and 15 meters wide and stands upright on the bottom on 25-26 meters depth. Where she meets the bottom small mounds of clay has been extruded from the bottom silt because of the pressure when &amp;amp;amp;amp;quot;landing&amp;amp;amp;amp;quot;. Sea water in this locality is almost brackish - this has a considerable effect on marine life on the wreck - you will find no salt craving organisms here. The wreck is covered with blue mussels and seaweeds - common shore crabs crawling along with fish like bullheads and rock gunnels. Around and inside the wreck cod is quite common. The bow of &amp;amp;amp;amp;quot;Vapper&amp;amp;amp;amp;quot; is majestic featuring a number of thick trusses hanging to the bottom. Swimming along bottom to the aft two large ducted propellers and rudders are found - here also the deepest bottom at +27 meters. At the aft a wide ramp is leading up to the aft deck at around 16 meters depth - this is covered by wooden planks and contains various machinery, winches and cranes. On either side two large smokestacks are found. The middle deck leading to the bridge structure is at 10-12 meters depth containing various kinds of access to the innards of the ship. The bridge is fully accessible through the open front windows and now almost devoid of any equipment - except a multitude of cables. The top of the structure is at 7 meters depth - a perfect place to hover and make your 3 minute stop on the way back. English (Traducir este texto en Español): &amp;amp;amp;amp;amp;quot;Vapper&amp;amp;amp;amp;amp;quot; is the giant wreck of an Estonian trawler combined with a build-in fish factory. She is approximately 102 meters long and 15 meters wide and stands upright on the bottom on 25-26 meters depth. Where she meets the bottom small mounds of clay has been extruded from the bottom silt because of the pressure when &amp;amp;amp;amp;amp;quot;landing&amp;amp;amp;amp;amp;quot;. Sea water in this locality is almost brackish - this has a considerable effect on marine life on the wreck - you will find no salt craving organisms here. The wreck is covered with blue mussels and seaweeds - common shore crabs crawling along with fish like bullheads and rock gunnels. Around and inside the wreck cod is quite common. The bow of &amp;amp;amp;amp;amp;quot;Vapper&amp;amp;amp;amp;amp;quot; is majestic featuring a number of thick trusses hanging to the bottom. Swimming along bottom to the aft two large ducted propellers and rudders are found - here also the deepest bottom at +27 meters. At the aft a wide ramp is leading up to the aft deck at around 16 meters depth - this is covered by wooden planks and contains various machinery, winches and cranes. On either side two large smokestacks are found. The middle deck leading to the bridge structure is at 10-12 meters depth containing various kinds of access to the innards of the ship. The bridge is fully accessible through the open front windows and now almost devoid of any equipment - except a multitude of cables. The top of the structure is at 7 meters depth - a perfect place to hover and make your 3 minute stop on the way back. English (Traducir este texto en Español): &amp;amp;amp;amp;amp;amp;quot;Vapper&amp;amp;amp;amp;amp;amp;quot; is the giant wreck of an Estonian trawler combined with a build-in fish factory. She is approximately 102 meters long and 15 meters wide and stands upright on the bottom on 25-26 meters depth. Where she meets the bottom small mounds of clay has been extruded from the bottom silt because of the pressure when &amp;amp;amp;amp;amp;amp;quot;landing&amp;amp;amp;amp;amp;amp;quot;. Sea water in this locality is almost brackish - this has a considerable effect on marine life on the wreck - you will find no salt craving organisms here. The wreck is covered with blue mussels and seaweeds - common shore crabs crawling along with fish like bullheads and rock gunnels. Around and inside the wreck cod is quite common. The bow of &amp;amp;amp;amp;amp;amp;quot;Vapper&amp;amp;amp;amp;amp;amp;quot; is majestic featuring a number of thick trusses hanging to the bottom. Swimming along bottom to the aft two large ducted propellers and rudders are found - here also the deepest bottom at +27 meters. At the aft a wide ramp is leading up to the aft deck at around 16 meters depth - this is covered by wooden planks and contains various machinery, winches and cranes. On either side two large smokestacks are found. The middle deck leading to the bridge structure is at 10-12 meters depth containing various kinds of access to the innards of the ship. The bridge is fully accessible through the open front windows and now almost devoid of any equipment - except a multitude of cables. The top of the structure is at 7 meters depth - a perfect place to hover and make your 3 minute stop on the way back. Regarding Position of Vapper - The position of Vapper has now been changed - hopefully now in its proper place!